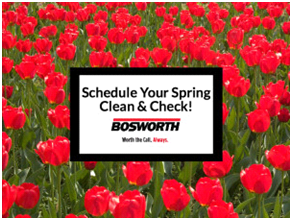 SPRING CLEANING IN KERRVILLE, TX - Bosworth Co. The Bosworth Company, one of Midland and Odessa’s leading plumbing, heating and air companies is based out of Kerrville, TX. We house a team of experts in the air conditioning and plumbing fields and are available to help you get your home ready for spring. Winter can take a toll on the plumbing in your home. In anticipation of the spring season, you’ll want to be sure your water heater is continuing to run properly. You also may have clogs in your drains that should be addressed during your spring cleaning spree. The Bosworth Company is one of the most comprehensive and responsive plumbing companies in Kerrville, TX. We employ a licensed and experienced staff that performs all of our plumbing services.